When my co-workers started breathlessly glowing about this book I'll admit I was dubious. I'm not a fan of historical fiction, I don't usually like long books, and I'm picky about my romances. I avoided reading this one for about a year until my store announced we would be hosting Lee for a signing. At that point I figured I might as well give it a shot. I'm so glad I did! I've read a lot of books in recent years that I've really enjoyed, maybe even loved, but very few of them were as fun as this one. I think I've become jaded. Rare is the book that I can't put down, that I can't wait to steal a moment in order to read, that keeps me reading past my bedtime. This was that book for me. It was just so damn fun! Monty was a walking human disaster, the epitome of Bad Life Choices the Person. His voice charmed me - he made me cringe and laugh in equal measures. I also fell in love with Percy almost immediately. Watching them stumble through the plot, and Europe, was a grand adventure. Sprinkled amidst the adventure there was plenty of heart as well. Even though the primary tension in the romance was a lack of communication, which usually makes me nuts, I understood the reasons why characters made the mistakes they did. I was all aflutter despite myself. I also thought the explorations of race, abuse, illness, and queer identity were all handled with a light touch, and rang true and poignant. In short, I cared about these people and I found them believable. There is a bit of a fantasy element stirred in, but it rather gets buried. 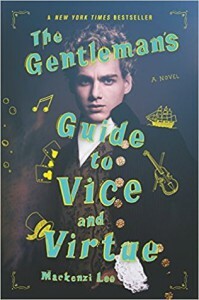 At its core Gentleman's Guide is, through and through, a good, old-fashioned romp. It's an adventure and a romance with just a hint of the fantastic. Complete with wit, action, adventure, and an emotional core that left me laughing and hurting in equal measure, it was a recipe that made for a read I couldn't wait to dig back into whenever I got a chance. For me this was the literary equivalent of a warm mug of cocoa on a chilly night.